I knew Dooley Womack first from his 1969 Topps card. I knew him as an Astro. In my letter, I confessed to Womack that I believed he was meant to play for a Texas team, having a cowboy-like name. 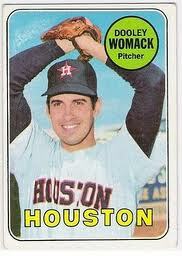 One of Womack’s best games in Houston was an eight-strikeout affair on April 24, 1969. Thanks to http://www.retrosheet.org/, here’s the details! “The eight strikeouts against the Padres: my curveball was working great, [Padres struck out] mostly swinging. Managers do their thing about managing the game. Also something not known: at Houston, Sunday afternoon game against the Giants. I went in for Denny LeMaster. Runners on, one run in. I threw a double play, inning over. In the next innings, I threw 3 more double plays. Fred Gladding came in and 3 more double plays, for a total of seven double plays. A record. Our manager Harry ‘The Hat’ Walker gave gold watches to all the infielders and catcher, with all 7’s on the face; Fred and I got nothing. But we have the memories. Coming Friday: Meet veteran ballhawk Zack Hample, author of The Baseball.